I’ve discussed plenty of portraits here but for the most part you’ve only seen finished works, and aside from a few notes on some of the more complicated portraits you’ve not seen how I actually put a portrait together, start to finish. 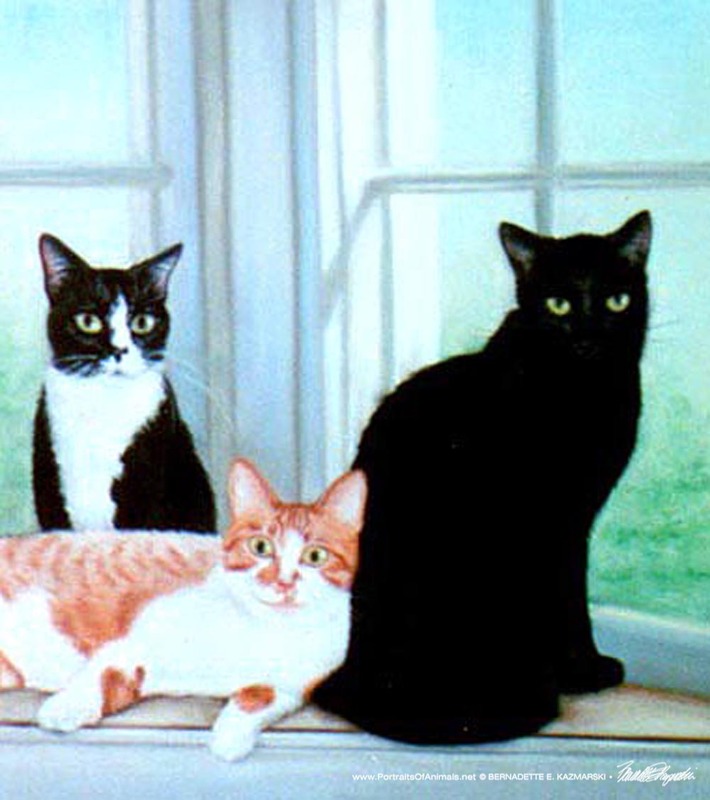 I had prepared the presentation of this portrait, painted in 1998, for my original website and it’s a good example of a pretty complicated portrait with several subjects and a scenic background, plus it’s five rescued cats, what could be better? The process is different for each portrait depending on what’s needed, and this portrait needed just about all the tricks I have in my little bag. I had the opportunity to visit their home and meet each one of them, and so spent about two hours talking to their mom about each one of them and following them around, photographing them in their habitat and with their habits even though their mom also had plenty of photos. Being able to photograph them myself gives me the best visual information—after all, would you photograph just your cat’s tail anticipating that someday you might need that photograph? I can do that if I feel I need it. Their mom adopted each of them individually either from shelters or from rescues, so each had a story that added to what I gathered about their personalities. We talked about where the portrait might be hung to help determine size and certain elements of the design, but she left the details up to me. Depending on the complexity of the portrait and how many photographs I have to combine to get the scene, I may simply begin the drawing with no preliminaries or will create a pencil sketch to size. However, it’s a rarity that I don’t combine fewer than three pictures, and for this one I lost count of the number of pictures I combined. I used to have to sketch it out, even enlarging and cutting and pasting on a copier but now I use PhotoShop, scan the photos or use the digitals provided and combine them into a final finished composite. Composite created from individual images and even bits and pieces of images. For this portrait, I created two composites which I liked equally, and so did my client, but in the end the spot over the fireplace made the decision for the long narrow format. 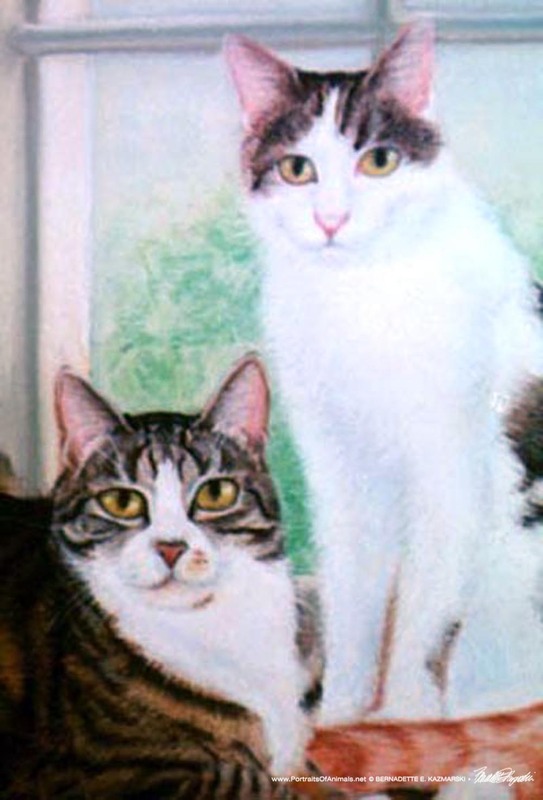 Each of the subjects is a composite of at least two photographs for face, paws, tail, eyes, ears, etc. I had an idea to use the bay window with windowseat for them all because the light was so beautiful and each of them visited this spot regularly, plus I enjoy painting architectural details. O.G. loved everyone while Veda was a little skittish and Miss Kitty kept to herself. 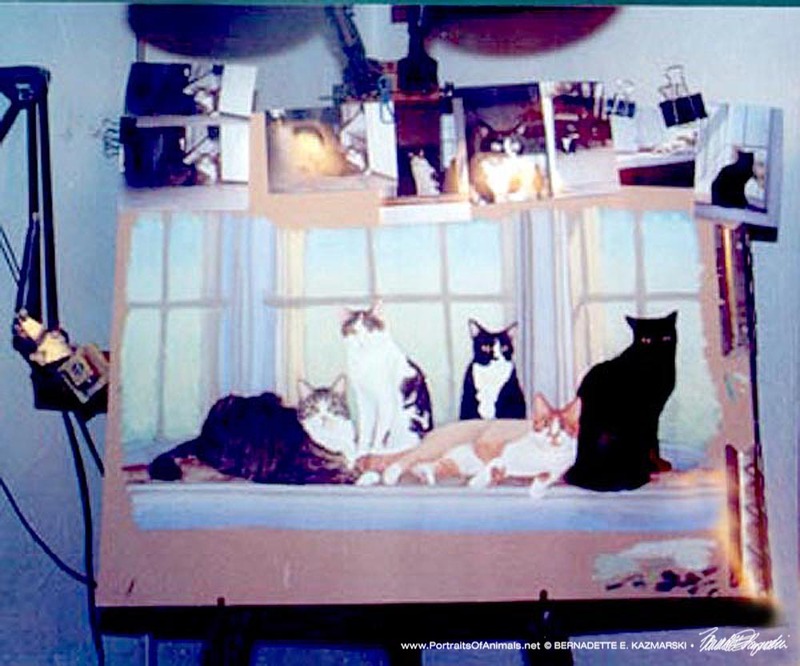 So I made a composite image of each cat, then combined each of the individual composites, added the window in the background with enough of the windowseat included for placement, and sent it off to my client for approval—on paper. 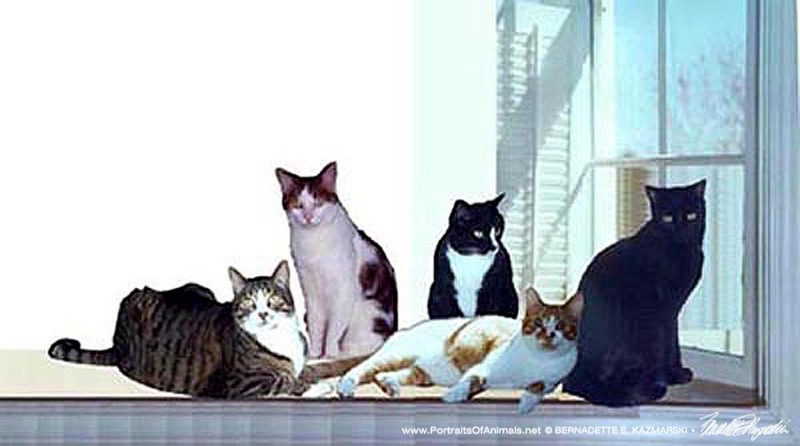 A composite like this also means I have to equalize the lighting, make up shadows and highlights and the lay of the fur when I get down to the final drawing and when designing the posture and setting, which can be tricky but also one of the ways my cats have earned their living as I model them into the pose and lighting I need…sort of. I always try to place the subjects against a background area which will complement their looks. But it’s not all about their looks—in combining multiples like this, I try to pair together animals which are friendly with each other and keep the “enemies” far apart. 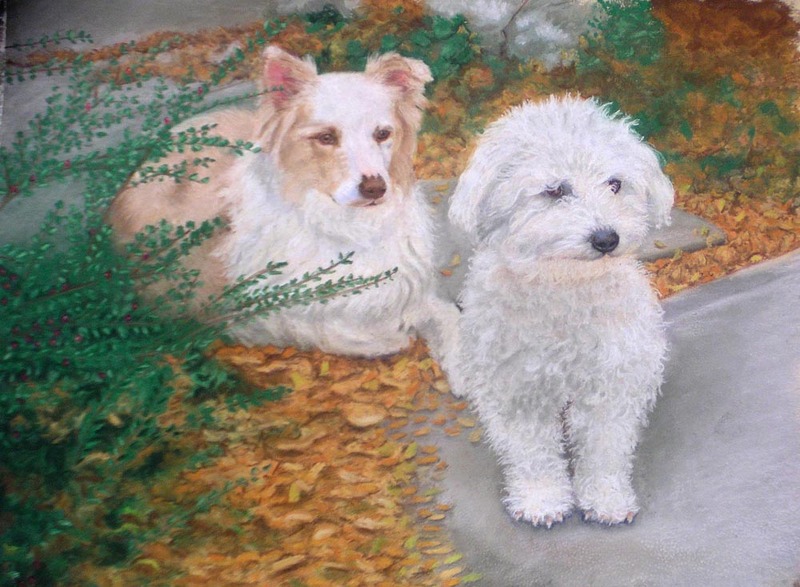 When I began work, I enlarged the composite to the actual size of the finished drawing, printed it out, covered the back with a dark shade of pastel, and transferred it onto my drawing paper, which is an archival quality, 600-grit sanded paper. After generally filling in the actual colors in the drawing and checking to make sure that everything was in proportion and in proper perspective, I was ready to work the actual drawing at my easel, with all the reference photos near. Ripley and Murphy were buddies. I usually work the background first, then work one subject at a time, keeping the whole work at about the same level of detail. I may go over a portrait three or four times this way, each time working more color and detail into the work. In this case, because the window is a large portion of the work, I wanted to make certain all the structure and detail of it wouldn’t compete with the subjects, so I left it with less detail and color than the subjects and the surface they’re resting on. The final pass adds the highlights in the fur, the whiskers and the sparkles in the eyes. When they look back at me from the drawing, I know it’s done. But it’s not really done until my client reviews it to make sure I’ve gotten everything right—after all, they are your companions, and I’d be just as fussy about mine. In this case, Veda was just not right—she’s a very tiny, slender cat, but shy, and the only clear picture I had gotten of her was of her hunched up a little scared under a table. Even though the image was accurate, it just wasn’t Veda, so my client sent me a few more photos of just her and I reworked that area. Since I had to slim her down and make her a little taller, and Veda is primarily black against a pale background, I had to actually lift quite a bit of pastel off of the paper and start over in some areas. If you compare the finished portrait at the beginning of this article with the sketch below, you’ll see the difference in Veda’s image. The portrait is nearly done. In the end, any portrait means I work closely with my customer, often at an emotionally difficult time, and we’ve found this can actually help with grief. I can stop at any point if it’s too painful, or carry on if it’s working well. 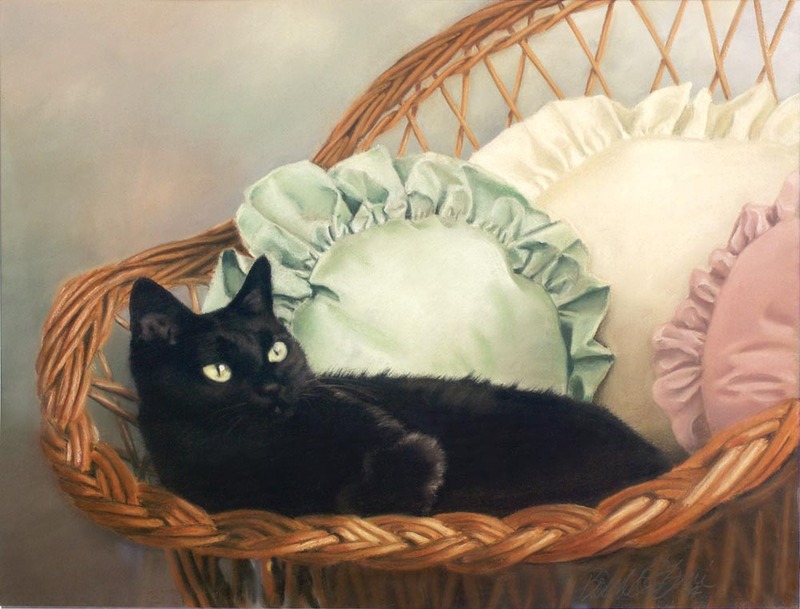 I’ve developed lasting friendships with many portrait customers, even long distance, hearing about new adoptions and losses, and several have returned for another portrait. It’s the part of this process I enjoy almost as much as creating a piece of artwork. They could Tabbies! 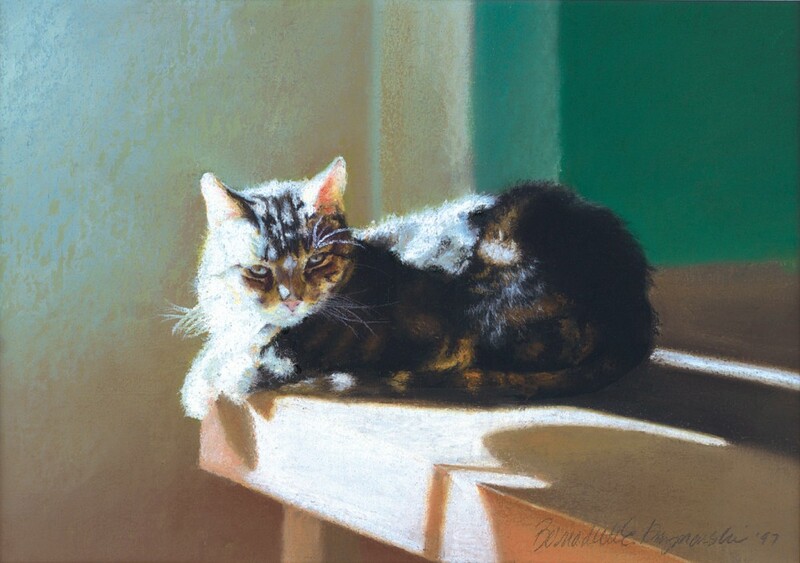 One of the things I love about portraits–we can always see cats we know in them, even if they are someone else’s cats.